In addition to these visual alarms, all Mass battery chargers have a potential-free relay contact. Charger on (AC on input, switch turned to ‘on’). Voltage sense (cable loss less than 3 V). Charger off (no AC on input, switch turned to ‘off’). Temperature sensor out of range. DC voltage out of range. Voltage sense (cable loss more than 3 V). General malfunction of the charger. The DC alarm only works if the battery charger is switched on. If you require a permanent DC alarm, regardless of whether the charger has input voltage and/or the charger is turned on, select the DC Alarm setting. Optional: A separate CSI alarm is optionally available for the Mass battery chargers and is placed in the connection box (if you require multiple alarms). Product code 21702000. DC voltage is out of range. The DC alarm works whether or not the charger has input voltage and/or the charger is turned on or off. Programming of the DIP switch is marked with continuous monitoring mode (ContMon). 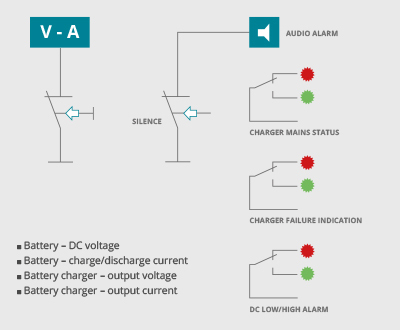 Optional: A separate DC alarm is available for all Mass battery chargers and is placed in the connection box (if you require multiple alarms). Product code 21702100. LCD display: DC voltage and charge/discharge current. Alarm functions: DC high/low voltage alarm visual/acoustic and potential-free contact. Alarm functions: AC alarm, no input voltage AC visual/acoustic and potential-free contact. CSI alarm: Charger Status Interface, charger error visual/acoustic and potential-free contact. The Mass Charger Interface makes your Mass battery charger suitable as a power supply/battery charger for devices such as GMDSS emergency systems for seagoing vessels and yachts. The alarm settings, charge current and charging method can easily be adapted using the LCD display and control button, and the front display can be easily and quickly installed on the charger. The Mass Charger Interface is optional and is delivered complete with shunt and detailed manual. The battery charger needs to be separately ordered. For the professional user, there is a front display with alarm functions according to GMDSS available. The GMDSS (“Global Maritime Distress and Safety System”) is a global maritime communication system which is part of SOLAS (Safety Of Life At Sea), using DSC and satellite communications.